Hi my name is Damian Duncan, and I am 38 years old. I live in Upper Hutt with my mum, Charles (a boarder) and 4 dogs. I was born with mild cerebral palsy and my left side of the body is weaker and smaller than the other side. When I was born, doctor told my parents that there is a place for children like me because I would be a vegetable and would never walk or talk. I proved them wrong and I am enjoying my active life style. I got my full drivers licence and recently joined the gym. My mum and I came back to Upper Hutt 2 years ago after living in Manawatu for 18 years, so that we can be closer to my family. 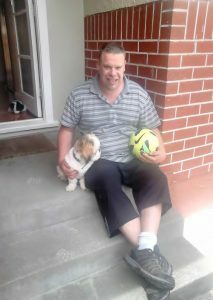 Since I got back to Upper Hutt, I have been looking for full time work and also the opportunities to get to know people in the local community. I have recently organised community indoor football games on weekends. I have done this because I believe this is a great way of exercising and also to get to know people in the community. I have been running this for over 3 months and I have already met other people from the local community. I feel that I am improving my life style through this because I am less nervous about meeting new people and talking in front of them. I am also getting physically stronger. 18 months ago, I didn’t have any idea of what to do with my life, and didn’t know anyone in Upper Hutt. With a support of Community Connections, I have tried many bush walks, bike rides and attended social events. I am feeling much more confident about myself and my future. I would like to continue improving my lifestyle and working towards my goals, I am excited to see the next chapter of my life.